The 1870-CC Seated Liberty Half Dollar was Coined in the First Year of Operation of the Carson City Mint. The Seated Liberty Half Dollar entered the channels of American commerce in 1839, and remained in production for 53 years. In all, there are more than 125 dates and varieties for collectors to find. One date that has certainly garnered more than its fair share of attention is the 1870-CC. The fabled Carson City Mint began operations that year, kicking out 54,617 half dollars. Nearly all of them circulated freely in America’s Wild West. Over time, most of them disappeared, leaving just a few hundred for us today. Nearly all Carson City coins are of great interest to collectors, but those from 1870, whether of gold or silver, are considered rare to extremely rare, and will always be under heavy pressure from the numismatic class. 1870 was the first year of production for the Carson City Mint. Only 54,617 half dollars were minted that year, of which just a few hundred exist today. 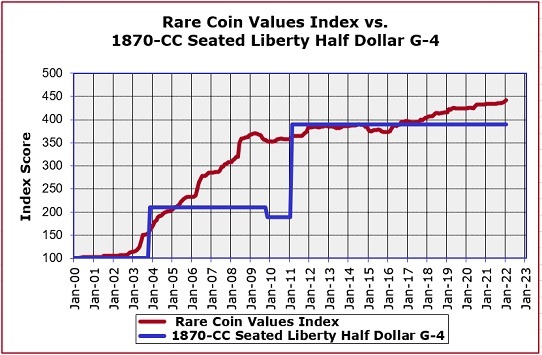 It may surprise some observers to note the mediocre performance since Year 2000 of the 1870-CC half dollar, as noted by blue line above, relative to the red line Rare Coin Values Index. The goal of the Index is to chart the strength and direction of the overall US rare coin market. The Index score is determined by the monthly percent change in value of a group of 87 rare United States coins. The 1870-CC is one of the 87 coins tracked in the Index.